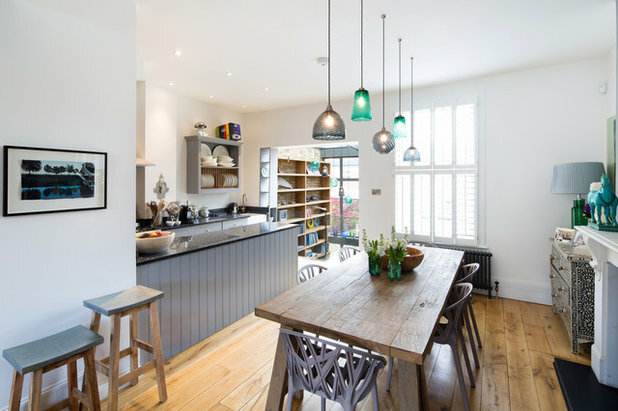 When you’re already extending at the back of your house, it could be the perfect time to consider just how much extra space you really could create – especially if you’re not confined to a one-storey design. And there’s a surprising number of ways to take your rear extension up a level (or three, or four). 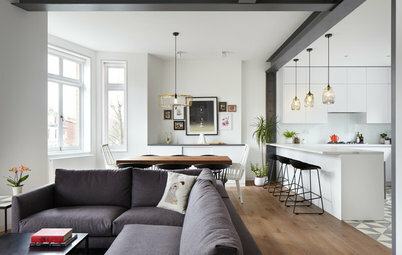 Yes, Planning Permission can be tricky, as can finding the smartest and most building-sensitive way to aim higher, but these inspiring projects from the Houzz archives might give you some unexpected ideas with which to get started if this is a project you’re considering. 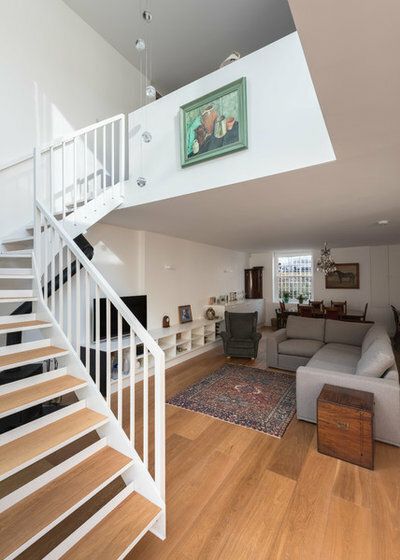 Here, you can see the lower-ground floor of this interesting, newly created space, where an open-tread staircase with a glass balustrade adds a light touch to the open-plan living room. 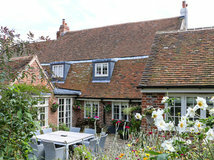 Two sets of French windows within the glazing – one on either side of the brick column – open to the garden. 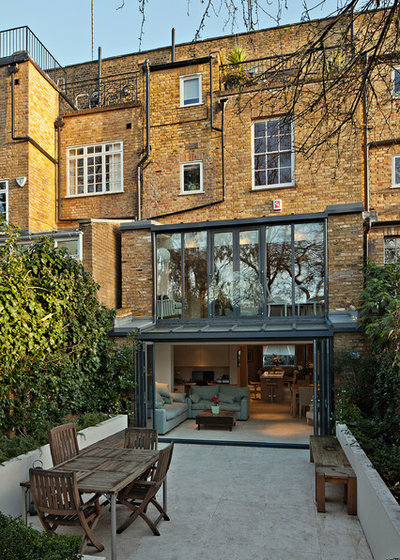 This part of the house is, in fact, the basement of this terraced property. Above it is the kitchen, on the ground floor (see next photo). There was already a dark, single-storey space at the rear of the building. 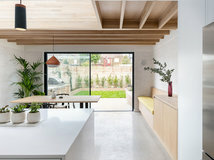 “We needed to find a way to effectively connect the floors into a single, useable space that felt like one room, and create a superb live-work area, not just a ‘bolt-on addition’,” explain the architects at Holland Green. 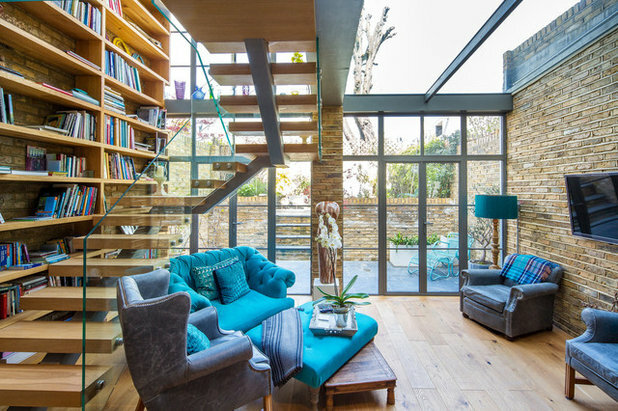 The result floods the house with light, has a feature bookcase that helps to connect the two floors visually, and gives both new spaces a strong connection to the garden. 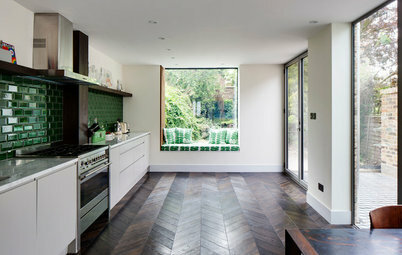 This is the ground-floor kitchen, looking towards the garden. 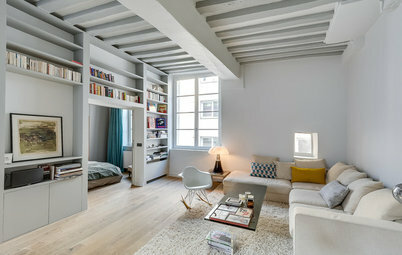 The bookcase that connects the floors can be seen beyond the units. 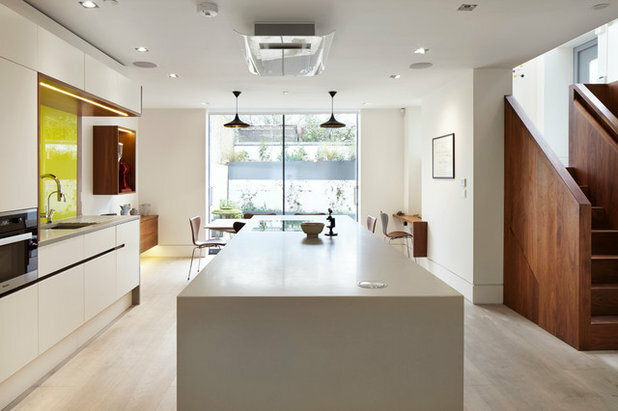 This incredibly narrow terraced house – said to be one of the slimmest in London – is just 2.3m wide and squeezed into a gap between two larger buildings. 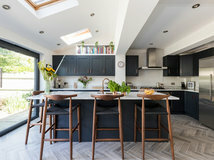 What was once a two-bedroom, one-bathroom home with no dining area is now a four-bedroom, two-bathroom house with a dining space opening onto the rear garden, thanks to the ingenuity of architect Tristan Wigfall of Alma-nac. And it goes one better than a double-height extension: the sloping roof you can see at the far end of the room here actually extends across no less than three bright and airy storeys. 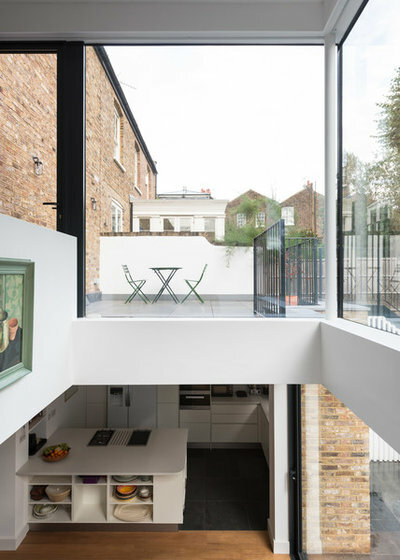 The secret is that, within the extension, the upper-level floors angle up to meet the sloped roof. “Cranking the floor plates to create the enlarged floor-to-ceiling heights was a key element of the design,” Wigfall says. 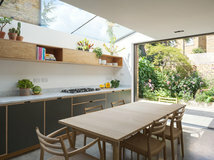 Rather than being sloped, as just seen, or flush, as in the first project, this two-storey rear extension, on a Grade II-listed property, is stepped, so the top part overlooks the (triple) glazed ceiling of the new room below. 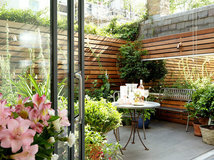 This view, from inside the first floor of the extension, shows the newly created dining spot with its lovely garden vista. 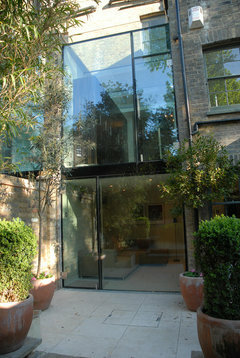 The double doors open to a glass Juliet balcony which, in the summer, provides even more of a connection to the outside. 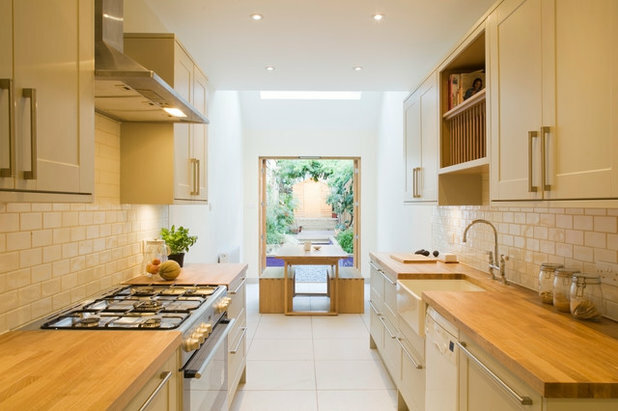 Below is a generous bespoke kitchen, which opens up fully to the patio. 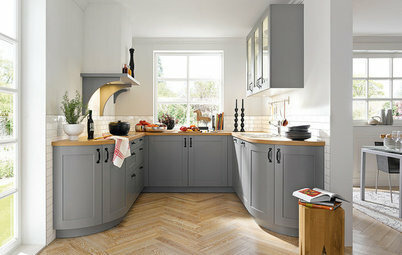 Sandstone tiles on the outside are matched to those on the inside to enhance the sense of a seamless transition. 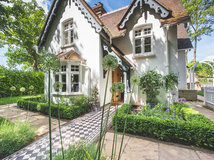 The renovation of this Locally Listed building by Fraher Architects involved a basement, ground and first-floor extension. Perhaps the most striking part of the renovation is the rather unusual glazed tower, known as ‘the lantern’ due to its appearance after dark, seen here on the left-hand corner of the building. 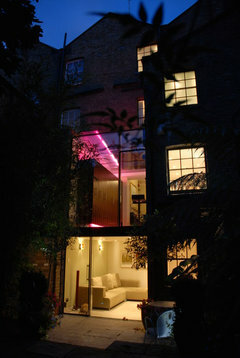 Two glass strips, one at the back of the house and another on the side, visually mark out the new and the old. 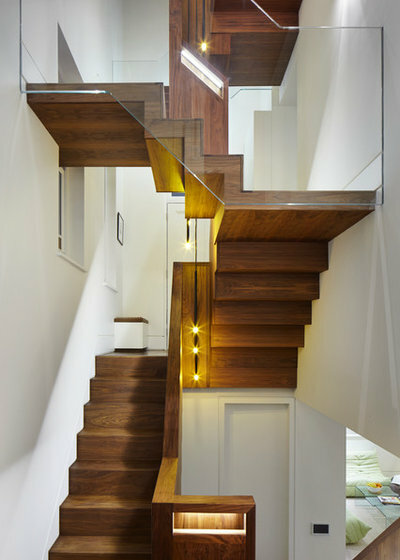 The purpose of the lantern structure was chiefly to enhance the connection between the spaces in this already tall home, and it does this in partnership with a new, four-storey staircase (seen on the right) in the main part of the house. 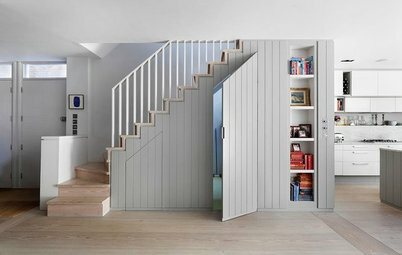 At the top of the house is a study overlooking the staircase. At the bottom of the staircase are the basement rooms; here (bottom right of the photo) you can see a living area that stretches into the lantern. 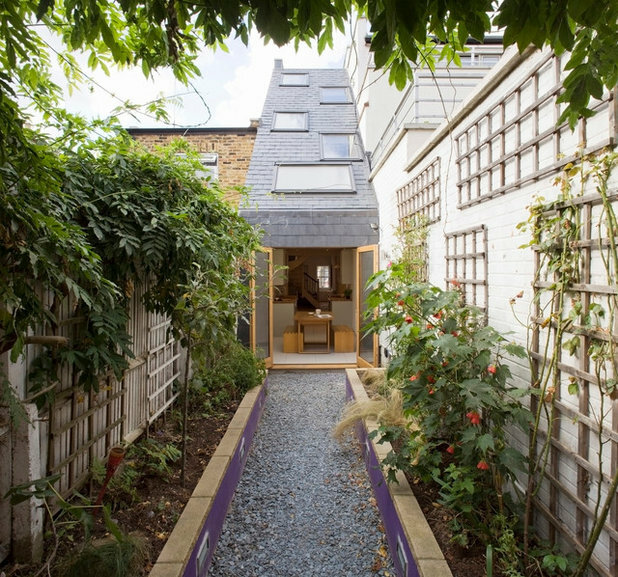 In order to create the space for this generously glazed two-storey extension, part of a semi-detached Victorian house, MW Architects dropped the floor level on the lower-ground floor and excavated much of the garden. 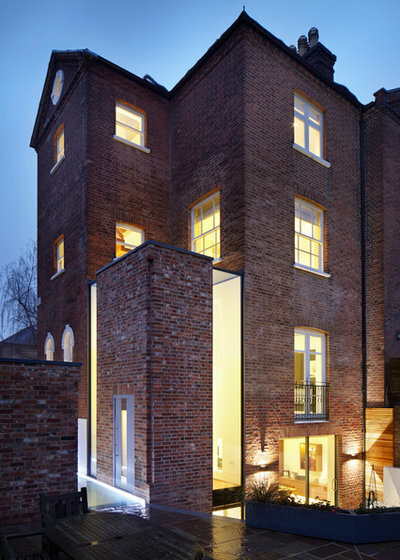 The existing rear wall was flattened off and rebuilt in traditional London stock brick. 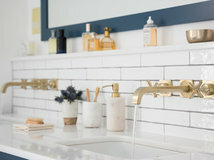 “Internally, we opened up the space on all three levels to create generously proportioned rooms,” explain the architects. 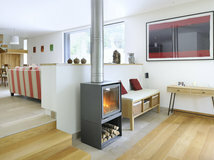 A new steel staircase connects this level with the open-plan living area below. 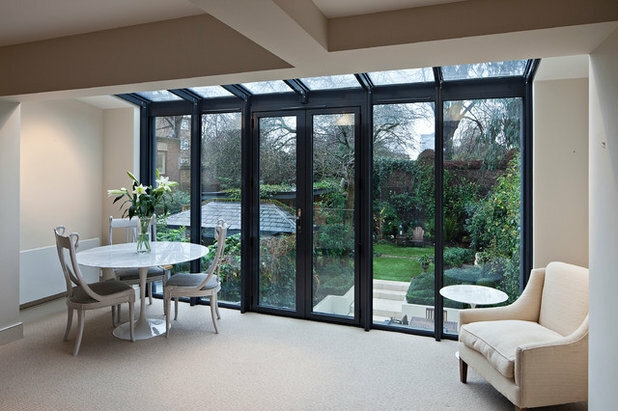 A large, frameless, corner window gives open views of the garden and a new terrace, accessible from the guest room/study. 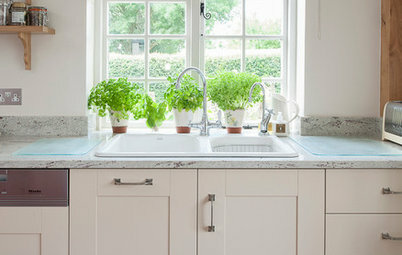 Want to see more of this home? 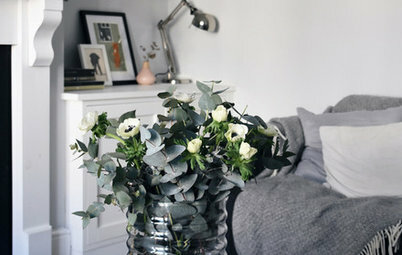 Click on the photo and then hit ‘Other Photos in This Project’ on the right. 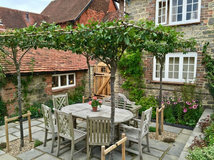 Are you planning a rear extension? 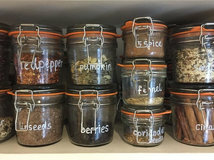 Or have you completed one and have tips to share? Tell all in the Comments section. 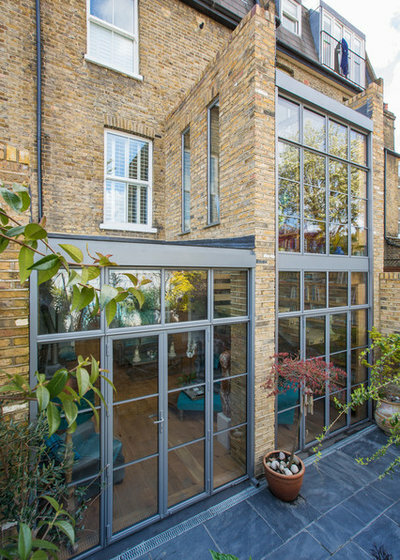 Permitted development is responsible for so many design disasters where homeowners are so obsessed with how much space they think they need, they have no regard for the appearance of the outside of the house. 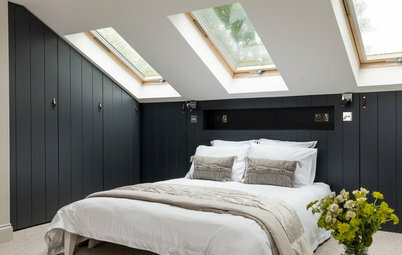 That dormer is hideous and quite rightly would be opposed by any planner with design acumen. In answer to the question from Mazitren - No, it wasn't permitted development, and the extension as a whole is now being used as a best practice precedent by the planning authority concerned. 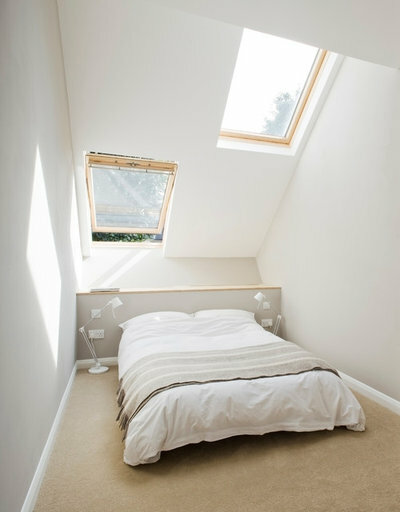 Neither is there any dormer window by the way. Very interesting article. 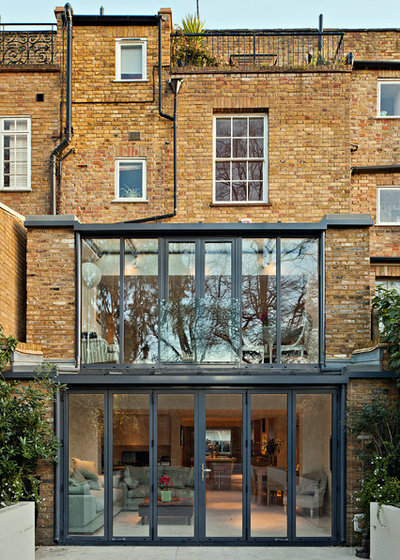 Another solution to two storey extensions is to use structural glass to create additional space. 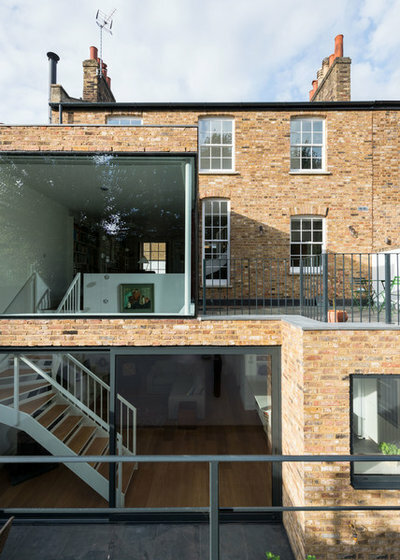 This can also help if the host building is in a conservation area or listed as it allows the original form to be preserved and enhanced, as well as still allowing light into the original rear space.